A 1999 earthquake in Taiwan significantly affected the chip supply, but it appears that the industry is luckier this time. A magnitude 6.4 earthquake struck southern Taiwan on Saturday morning local time, prompting concerns that local semiconductor manufacturing plants would be affected. However, although major chip foundry Taiwan Semiconductor Manufacturing Co. reported damage, the company said it could make up any lost production. The earthquake struck at 3:57 am local time, according to the U.S. Geological Service, about 30 miles away from Tainan in southern Taiwan. There, the earthquake collapsed an apartment building, killing two. Reuters also reported that more than 100 injuries were due to the quake, as buildings canted at odd angles after being knocked askew. 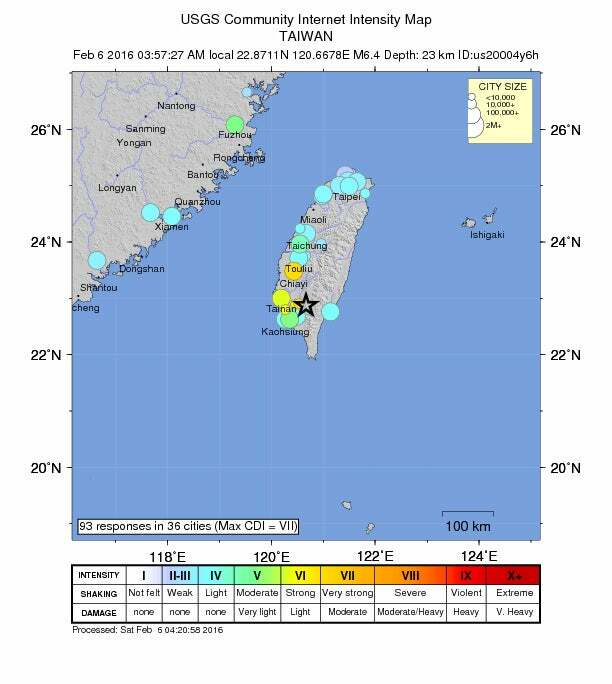 The USGS map of the Feb. 6 earthquake in Taiwan. Why this matters: For the technology industry, the concerns were that the quake could knock out a vital cog in the semiconductor supply lines. In 1999, another quake in Taiwan killed about 2,400 people and cut power to thousands, including chip fabs. The resulting loss of in-process wafers and the time necessary to restart those fabs generated a ripple effect on chips manufactured for computers and other electronics, halting shipments and in some cases causing price hikes. Since then, however, chip fabs have been built with seismic safety in mind, and manufacturing has expanded west onto the Chinese mainland. The majority of semiconductor manufacturing is also located to the north of the island, near Tsinchu. Still, one of four TSMC major "gigafabs" lies within Tainan, producing more than 100,000 300mm wafers per month. A second fab, Fab 6, also resides there as well. UMC, another major chip foundry, also owns its own 300mm wafer fab within Tainan. It's these wafers that hold the semiconductor dice,which are eventually packaged into the chips found within graphics cards, networking equipment, and the like. According to Reuters, the sharp quake broke the in-process wafers being manufactured at the TSMC facility in Tainan. But the quake struck at a fortunate time: not only has manufacturing slowed during the seasonally slow first quarter, but the island was about to start its New Years' celebration. TSMC will apparently suffer a short-term halt to manufacturing, but will simply ramp up its manufacturing to compensate. For its part, UMC also told Bloomberg that its fab will need some time to "recalibrate". Major chip manufacturers like Intel do not have fabs in Taiwan; instead, the company has sited them in Arizona, Oregon, and overseas in Israel, Ireland, and China. AMD manufactures its chips through a partnership with GlobalFoundries at fabs in New York, Germany, and SIngapore, among others.